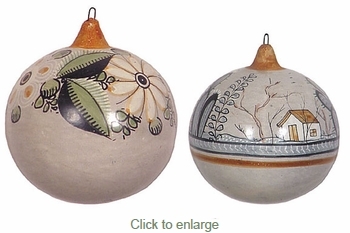 Each handpainted clay Christmas ornament is a work of art that will make a great gift for the holiday season or add a festive and colorful addition to your own holiday decor. Expect some variation in size and color with these one-of-a-kind hand crafted southwest Christmas ornaments. FJ8020 - Small 2" Dia. $11.45 ea. FJ8021 - Medium 3" Dia. $13.75 ea. FJ8022 - Large 4" Dia. $16.00 ea.